Were you at the third show in New York City? What were your highlights? Post your own review and add your photos below. Definitely one of the best concerts I've ever seen. Desire with Jimmy Fallon was awesome, and then bringing out the Roots for Angel of Harlem was INSANE! And then the ending with One where everyone was singing along was one of those great moments. So I wrote a review of the 7/19 show which didn't end up getting posted. 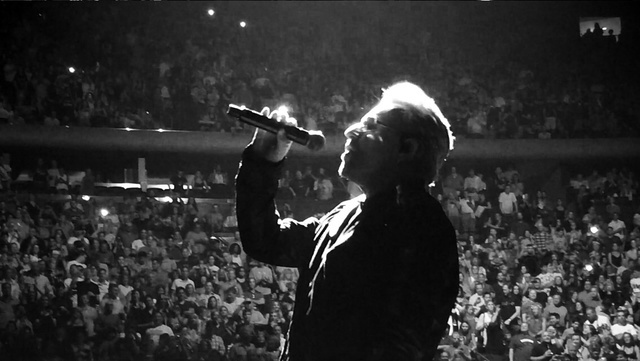 I said there that U2 shows at The Garden are always special. The highlight for me on Sunday night was the stirring Stuck in a Moment with an intro by Bono on the power of friendship. Tonight was extraordinary: Jimmy Fallon on Desire, the Roots on Angel of Harlem but the high point was Bono joining the audience on One, really incredible, memorable, wonderful. This was my last show of the tour. Thank you for all the years of tours. With all my heart U2!!!! We have been at the show (7/22) the sound was awful. Sorry but it is true. Lots of people outside agreed the worst sound in U2 history. Beautiful videoscreen but the soundcheck has not been made properly ! Long time coming for my love! I know this song comes and goes, but PLEASE PLEASE play ONE.... on 7/22.... many of my favorite songs don't make it to your tours: Kite, Ultraviolet, Stay. Let me enjoy One, it has always been my favorite part of the shows since I started going in 1997 and this will be my 10th show! Tues 9 Sept 2014 the day U2 released their Songs of Innocence album, will live in my wife Angela's heart & mine forever. It is also the day Angela's brother Jim aged 52 lost his three year battle with cancer. Jim, like us was a massive U2 fan. Out of tune he would sing loud their songs with passion at family gatherings & partys. We have travelled from Wollongong in Australia to listen & see his/our favourite band live at Madison Square Garden on Wednesday 22 July. In Jim's memory we'll sing the songs for him that night. I'm sure I'll love everything they play, but I'm really hoping they play Bad, One, and close the show with 40!!! So sad waited outside with my 9 year old daughter in the heat in hopes of seeing u2. So sad we didn"t see the band. Still so excited to see the show tonight meeting the band would have been awesome after 34 years! Coming back Thursday to try again! i've seen every u2 tour since and including unforgettable fire am bringing a friend who has been a long time fan, but has never seen the band live. can't wait to see his reaction in nyc! please surprise us with a ramones cover in nyc--would be more than fitting . . . I'm fascinated!!!! I will celebrate my birthday with U2 and all the U2 fans there!! !